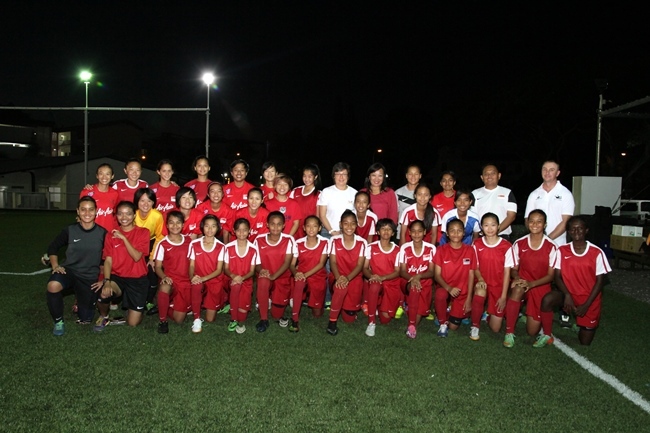 SINGAPORE, 18 APRIL 2015: The ‘A’ and Under-14 Women’s National Teams were honoured when Moya Dodd, FIFA Executive Committee Member, Asian Football Confederation (AFC) Vice President and Chairman of the AFC Women’s Football Committee, squeezed some time out of her busy schedule during her Singapore stopover to pay a visit at their training session on yesterday. Ms Dodd is the former Vice-Captain of the Australian Women’s National Team, The Matildas, and has played football for over 30 years. She shared with the players about her playing experience and told them how lucky they were to be able to play and train and have current facilities and resources compared to what the players had during the time she first started playing football. She encouraged the Young Lionesses and Senior Lionesses to carry on their passion and train hard to achieve their dreams. One of the players, Sabrina Mathe, was inspired by Ms Dodd’s encouragement to always believe in yourself after the Australian answered Sabrina’s question on what kept her motivated when the path in football does not look bright, for example when a player is not selected to be in the squad. In turn, Ms Dodd asked the players what their dreams were, to which Senior Lioness Charmain replied that it was to participate in the 2017 Southeast Asian (SEA) Games.